If you ask an Israelite about their country's national symbol, many individuals would declare it to be the Lake Kineret for its importance in a life of the country. It is Israel's largest fresh water lake and the most important source of drinking water for Israel. 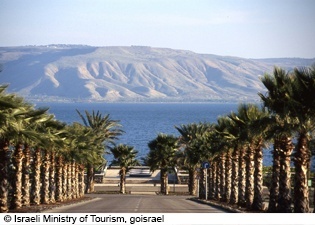 Besides that the Lake Kineret, also called the Sea of Galilee, is a major tourist attraction as Jesus lived and preached on its shores and in the surrounding areas. Many of his miracles, including walking on the water and the miracle of loaves and fishes, were performed here, which makes the Sea of Galilee a pilgrimage site for many Christians. The Lake Kineret would also excite those interested in the natural sites or beach vacation. Another important historical and religious destination in Israel is the Jezreel Valley, where among the blooming fields a tourist can visit some biblical sites such as famous Tel Megiddo national park, a location of Armageddon from the Christian Book of Revelations and Nazareth. The valley takes it`s name from the Hebrew “ God will sow” and it reveals a lot about this special place. Famous for its fertile land the Jezreel Valley is an inviting vacation destination with many family activities and a wide selection of fine restaurants. From a fertile valley to a windy desert of Negev, Israel's climate and geography is as interesting as ever. Despite being scarcely populated the Negev is famous for its history and heritage. These sandy hills have been settled since the prehistoric times and are a birth land of many distinctive small nations. One of them was the Nabateans, who established the Spice Road to bring spices, salt, and perfumes from Yemen to the ancient port of Gaza. And here, among the sands Abraham had his home, Be`er Sheva. Israel, a country the size of the half of Costa Rica, offers excellent skiing conditions in the Golan Heights in the northern part of the country. As you climb higher above the sea level the surroundings become more and more magnificent and the Golan Heights introduce incredible natural views and many fascinating cultural sites. From the Hermon Mountain to the Lake Kineret the Golan Heights offers many opportunities for skiing and hiking. In the ancient times as well as now the Valley of Elah was famous for the winemaking in Israel and abroad. This hidden gem is located just a short drive away from Jerusalem and visitors would be greeted by the endless scarlet fields of flowering anemones where an epic battle of David and Goliath took place many centuries ago. Also an ancient biblical town of Beit Govrin can be visited by history enthusiasts where they can see an underground settlements of the first Christians. Many natural wonders and exceptional views would greet a nature enthusiasts visiting a region of Galilee. Many rivers, high peaks and thick forests are characteristic for this mountainous north region of Israel that is a very popular visitor destination. 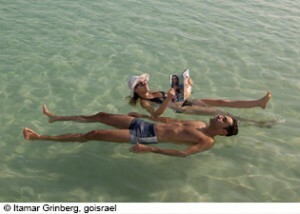 From a vigorous and fascinating mountainous region of Galilee to as fascinating, but much less alive Dead Sea. Everything about this large body of water is amazing: a level of saltiness preventing anything alive to take root in the water to the number of meters (417) below the sea level. But that same salt of the Dead Sea is a natural cure for many skin issues and diseases, which attracts many visitors in search of the medical benefits. But this desert region also attracts people interested in the cultural heritage and the ancient history. Among the most interesting historical sites are the Massada fortress, a place of a final brave standing of a small community against a large Roman army and the Qumran cave where ancient Dead Sea Scrolls that reveal much about life of the first Christians were found. The city of Jerusalem needs no introduction as it evokes a bright image of an ancient history and culture, interesting archeological sites and wonderful architecture, a gastronomic adventure and many theaters and arts. All of these attractions can be found in the old and a new part of Jerusalem. The old town is famous for it`s historical attractions and a new part of Jerusalem is inviting with the many museums, restaurants and many cultural attractions, such as Machane Yehuda market, the Biblical Zoo, the Knesset, and the Museum of Italian Jewish Art. While the ancient history and all the natural wonders make Israel an incredible and a wonderful country to discover, then the events of modern times beginning with the turn of the 20th century and ending with the current events in the Middle East make Israel a complicated place to visit and some regions should be avoided by tourists. Such places are Gaza and the West Bank regions where a conflict of many years still aggressively rages on, but at times the whole country becomes an unsafe place to travel due to military actions. It had began with a massive relocation of Jews and Arabs and promises of an autonomous territories by a British foreign policy, which eventually led to an unstoppable, unresolvable, and a bloody conflict between Israel and its neighbors. Highlights of Israel are thus timeless and unreal no matter when you travel or where you go once you are there!